In the 1930’s, Bobby (Eisenberg) a young Bronx native moves to Hollywood where in falls in love with Vonnie (Stewart) a secretary of his powerful uncle, and agent to the stars. After returning to New York, he is swept up in the vibrant world of high society nightclub life. Woody Allen is one of my favourite auteurs, he has created some truly iconic movies such as Annie Hall (1977) and Manhattan (1979). In the early 2000’s many had thought that Allen had lost his way. Since then he has managed to steer Penelope Cruz and Cate Blanchett to Oscar glory. He is one of Hollywood’s most prolific and consistent directors, having released at least one feature film pretty much every year since Annie Hall won for Best Picture in 1978. ​My last movie from Woody Allen was Midnight in Paris (2011) starring Owen Wilson and Rachel McAdams. I enjoyed that movie and especially liked the clever time travel element. Midnight in Paris is Allen’s highest grossing movie of all time, grossing $151 million dollars worldwide, and it earned him his fourth Oscar for Best Screenplay. He’s been nominated no less than 19 times. Café Society, which is once again also written by Allen marks his 45th feature film. It’s a period piece that concentrates on the golden era of Hollywood – the 1930’s. The movie marks the first time Allen has narrated a movie without appearing on-screen since Radio Days (1987). The movie also marks the first time Allen employs the use of digital cameras to film his movie. Café Society is an enjoyable and atmospheric trip into the timeless mind of Woody Allen. The movie revisits well trodden Allen themes such as younger girl falls for older man, the central character is a neurotic Jewish New Yorker and the movie takes place in an almost exclusively intellectual predominantly white society. Leading the charge is Jesse Eisenberg, who I found was perfectly suited to Woody Allen’s style of writing. His nervous and neurotic delivery was perfect. Although at times it was a little too reminiscent of Allen himself, coming off more as an impression of Allen in his earlier movies such as Annie Hall and Manhattan. Maybe that’s just how Allen told Eisenberg to play it. This movie sees their 2nd collaboration after 2012’s Rome with Love. Given Eisenberg’s near perfect delivery of Allen’s material it wouldn’t be a huge stretch to see him play Allen in a biographical film. Kristen Stewart is a delight as Vonnie, the source of Bobby’s deep affection. This marks the second on-screen paring with Eisenberg after American Ultra (2015). She is clearly an actress that is being offered better vehicles to distance herself from the Twilight Saga. Steve Carell was also good as Phil Stern, Bobby’s uncle, but he really played a slightly sharper and ruthless version of Steve Carell. Bobby’s family were also a casting highlight of the movie with Ken Stott and Jeannie Berlin as his mom and dad being my favourite. Café Society also stars Corey Stoll (Who looked like he was sporting a glue on wig) as Eisenberg’s brother and Blake Lively (Mrs Ryan Reynolds) as his wife. Both actors I felt were not particularly well used given their stature. They could have been played by any actor. As for the movie itself it is beautifully shot, with sun kissed visuals, relaxing 1930’s jazz and featuring atmospheric sliding fades between various scenes. There’s no mistaking that Allen wrote the script, as a result it had me laughing at several times during the movie, it’s just a shame that it lacks the razor sharp wit and observations that his earlier work so clearly and easily demonstrated. The premise of Café Society is very simple and one that as with so many Allen movies revolve around love and attraction. It’s by no means an “amazing” movie and will no doubt go down in history as one of Allen’s middle of the road entries as he continues to tread familiar ground. But, with the man himself turning 81 this year, it will be a sad day in cinema when Woody Allen films are a thing of the past. 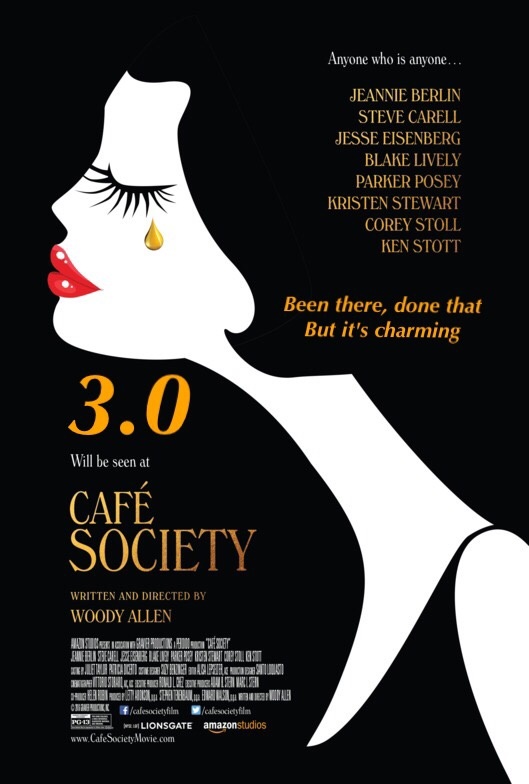 If you are a fan of Woody Allen movies or just looking for a change of beat from the summer, check out Café Society, I’m sure it will prove to be your cup of tea or is that café? Café Society is released in the UK from today.